Yesterday’s signals were not triggered, as the bearish price action took place slightly above 1.1486. Go short following a bearish price action reversal on the H1 time frame immediately upon the next touch of 1.1486. 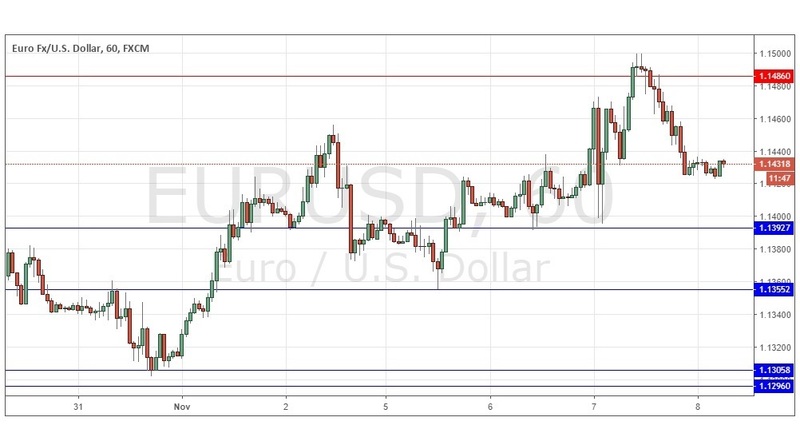 Go long following a bullish price action reversal on the H1 time frame immediately upon the next touch of 1.1393 or 1.1355. I wrote yesterday that I thought this pair as likely to be interesting short if the U.S. Dollar strengthens later, although it is quite probable this won’t happen until the FOMC releases tomorrow. I was not convinced of direction. This was a good call as yesterday’s action was inconclusive, but the price fell as the Dollar strengthened after the resistance level had been reached. The picture is very weakly bullish over the short to medium-term, but the Euro is not one of the stronger currencies, so it is still the short side that probably has the most potential. It is likely that action will be subdued ahead of the FOMC release later. That release may get the price moving again, and if it is hawkish, there will probably be downside potential. There is nothing important due today concerning the EUR. Regarding the USD, there will be a release of the FOMC Statement and Federal Funds Rate at 7pm London time.